The High Line is cool, a representation of what is more to come in park development. It brought a lot of attention to landscape architecture which I like, but must every elevated project be referred to as the "High Line of the [fill in the geographic location]? Or for that matter parks of the west being referred to their eastern counter parts (i.e. The Great Park as the Central Park of the west). Given the climate, far greater flora/fauna opportunities, and cities such as LA with a dearth of proper parks and integrated green infrastructure, I foresee the west becoming a hotbed of landscape architecture, in addition to the east of course. [Rendering of the "Great Lawn." The port city of Wilmington’s version, for now known as the Harry Bridges Boulevard Buffer, neither extends along an abandoned railroad nor is it particularly narrow like New York’s prototype. Instead, it consists of a 30-acre, nine-block-wide stretch of sloping land that separates the busy Port of Wilmington from a residential neighborhood to the north. The $55 million project is well underway and set to be completed by next summer. Designed by Sasaki Associates and under construction, the park forms a barrier from the port, established after public outcry from the port's extension, the original plan. HBBB get's its reference to the High Line from the elevated sound wall sloping the park to the east and separating it from the street. 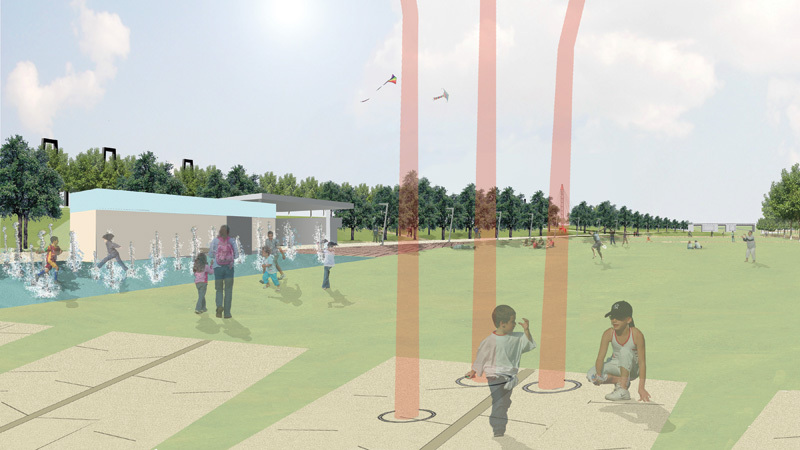 The park will include tree groves, open lawns, pavilions, fountains, and an amphitheater. To break up the mass and ease circulation, the berm will have several openings connected via pedestrian bridges. One bridge, a steel span structure designed by Arup, will be the centerpiece of the design.